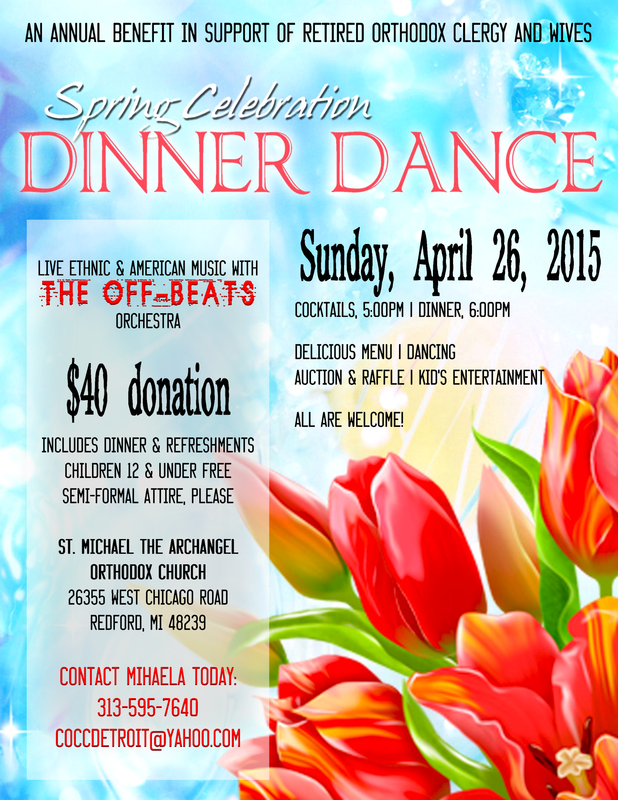 DETROIT, MI [COCC] -- The Council of Orthodox Christian Churches of Metropolitan Detroit [COCC] will sponsor its annual "Spring Celebration" dinner-dance at the banquet hall of Saint Michael the Archangel Church, 26375 West Chicago Road, Redford, MI, on Sunday, April 26, 2015. Proceeds from the event will assist retired clergy and widowed clergy wives. The event will begin with a social hour at 5:00 p.m., followed by a buffet dinner at 6:00. There will be live music by the Offbeats and entertainment for children. Tickets are available for $40.00 per person. There is no charge for children ages 12 and under. Each COCC member parish will receive complimentary tickets for its clergy. To order tickets or obtain further information, contact Mihaela Charlier at (313) 595-7640 or coccdetroit@yahoo.com, or Richard Shebib at (248) 345-9346 or president@coccdetroit.com. The COCC is also soliciting donations from merchants for a silent auction and advertisements in a souvenir book that will be distributed at the event. The deadline for submissions is April 14. For ad rates and further information, contact Mary Ann Dadich at (586) 775-4799 or mdadich811@gmail.com, or Richard Shebib at (248) 345-9346 or president@coccdetroit.com.